Most of you probably have been there before, now I have lost my sewing mojo somehow. It does not mean that I do not sew at the moment, but it does not give me the joy it should. Mainly because I had a few failures in the last time. So I lost my confidence and with that my mojo went away. I am also behind with blogging (I finished my Marfy Jacket finally, a second version of the Emily culottes and a Watson bra). After completing the Jaqueline Hoodie I was so eager to start sewing dresses and already chose some patterns and fabric. But I had promised my friend to sew sweat pants for him, so that came first. Sweat pants are easy, right, so this should not take too long. I somehow managed to mix up the front and back resulting in the pockets pointing in the wrong direction. I needed more time unpicking than actually sewing (black thread, black fabric, serged seams…). Eventually they were finished and it was all dresses again. We will go to the “Phantom of the Opera” end of June for my birthday, so what better reason do you need for a new dress? And how about Marfy 3414? I had the muslin already cut out last year, so it was just basting it together. Alas, the fit was awful. A lot of gaping and too much fabric in the bust area and too small in the waist. Obviously I do not have a “Marfy compatible” body. 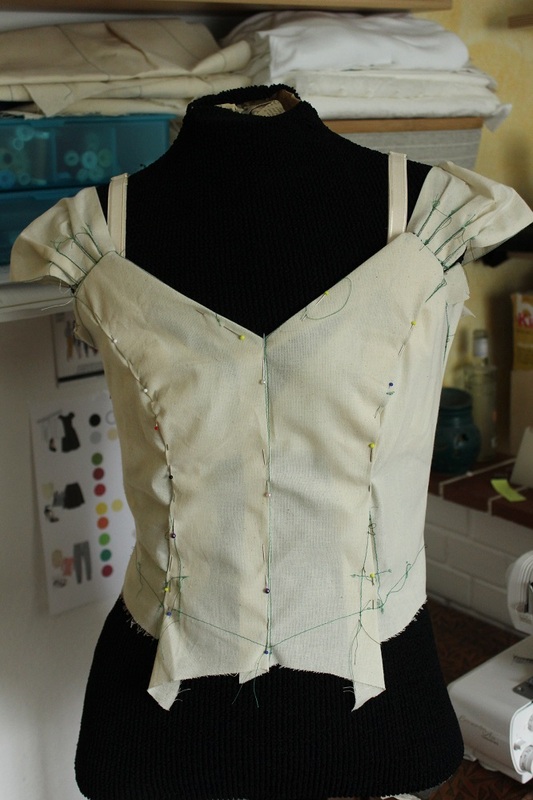 I released the waist darts and pinned out the excess fabric along the princess seams. I also thought about shortening the straps a bit. All these changes had a lot of impact to the neckline and the straps were no longer sitting at the end of the shoulder. I decided that this would take a long time to get the fit right and put it aside. So I tried a knit dress. A knit dress is easy, right? You can sew it up on a weekend and usually you do not have any fitting issues, maybe a tweak here or there. I chose Vogue 8593. As I wanted to use a knit with a flower print, I eleminated the center back seam and shortened the back darts. This should minimize the disruption of the pattern. I made up a muslin (I am so glad I did), and the back turned out great. However, the front, way too much fabric below the bust. 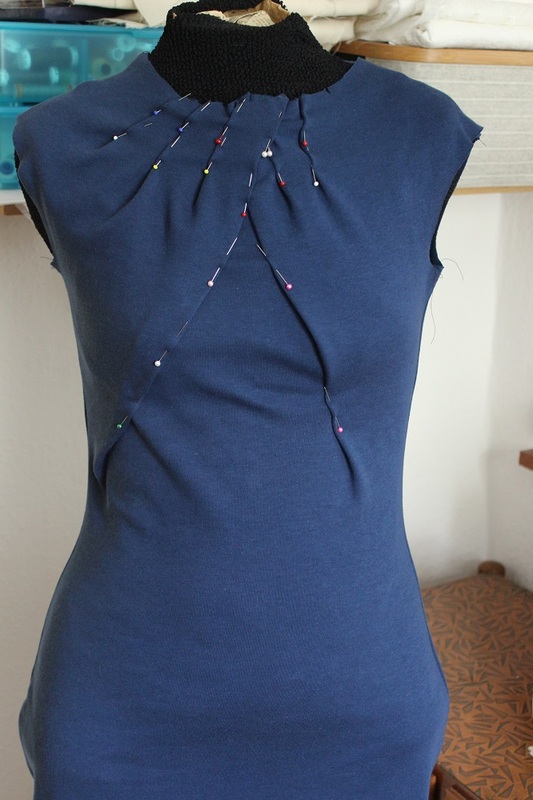 I know I have a small bust and usually have to make a small bust alteration for woven fabrics. With knits I usually can get awaywithout. Not with this pattern. I pinned out the excess fabric, but I have no idea how to change the pattern. The pattern has not front darts, I guess they disappeared in the pleats. 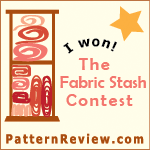 I would try to hide the extra fabric in the pleats, too. Maybe I can try to drape it on my dress form. The two sides also differ. I assume this is due to the assymetric center pleat. Do you have any tip what I should do? In my despair I turned to knitting. I started a Myrna cardigan and are slowly deciphering an English knitting instruction. What would I do without You Tube? A big thank you to all the people who publish these great tutorials. I bought some yarn that was on sale as I am a total beginner with knitting and I have no idea how this will turn out. At the moment it looks quite promising, though. If you have seen my sewing mojo, please ask it to come back to me. I will give it a warm welcome! This entry was posted in knitting, Marfy, sewing, Uncategorized, Vogue and tagged cardigan, knitting, Marfy, sewing, vogue. Bookmark the permalink. 11 Responses to Have you seen my Sewing Mojo? Good luck! I just recently recovered my mojo…doing a few tried and true basics that I needed, even if they weren’t special or blog worthy. Best of luck! Thanks, Suzanne. That is also a good advice to turn to some basics! I am not sure, since I have not seen the pattern, but I would draw those lines you pinned below the bust into the pattern and make them longer until the side seams. Then mark the additional fabric not needed, that should give you something looking like a dart, cut it and glue it back together. that might make your folds at the top a little smaller though. I hope this helped, if not, you could send me a picture of the pattern and I can make a sketch showing you what I mean. when I loose my sewing mojo, I often just take some days free and latest after a week I am missing it so much, I just have to start again. I think I have an idea about what you mean. I will send you a picture nevertheless, thank you so much for the offer! Lost your mojo? That is so sad! Hopefully by the time I read this and comment, it will have returned! Writing about it already helped and I started a new project. I often make the mistake that I want to finish something quickly. Usually that are the projects that go wrong. Yes, I understand. It happens to me too! I can so relate to this! After all the hustle of sewing for Christmas, I could not get back my mojo either. I finally had to commit to a project for someone else before I could get back on track . My sewing machine had been very neglected too! Hope you find it soon.😄 My husband is happy too! I am much happier when I am sewing. Hehe, I also feel somehow lost when I am not sewing. Seems like I am a bit addicted…. I looked at the pinning in your knit dress and thought, “Wow, I love the pleated neckline detail!” Maybe you could think about adjusting the pleats to be a little more symmetrical and go with it as a new design. It would look super on someone with a smaller bust. The pleats on the neckline are from the pattern, but not the two long pleats that go down. These I would like to get rid of somehow.